Other Products: Watercolor Cardstock and Pearls. Instructions: Cut a piece of 4 3/4" x 6 3/4" piece of pattern paper from Tulip Time Paper Collection and adhere it to a 5" x 7" white card base. Cut another piece of 5 3/4" x 2 1/2" pattern paper from the same paper collection and cut the top at an angle so that the height of left side is 1" and the right side is 2 1/2". Adhere this piece to the bottom of the card. Die cut a piece of black cardstock using the largest die from Diamonds & Lace Die and adhere it to the card font as shown. Die cut a piece of black cardstock using the eyelet die from Eyelet Rectangle & Basics Die and adhere it to center of the previous die cut using Darice Adhesive Foam Strips. 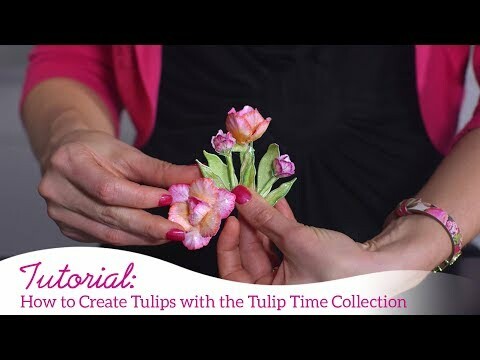 Mat it with a piece of pattern paper from Tulip Time Paper Collection. Die cut a piece of white cardstock using the doily die from Butterfly Kisses Decorative Die and adhere it to the Eyelet Rectangle layer using Darice Adhesive Foam Strips. Die cut 4 pieces of black cardstock using the dies from Diamonds & Lace Die and adhere them on a strip of pattern paper as shown to create a border. 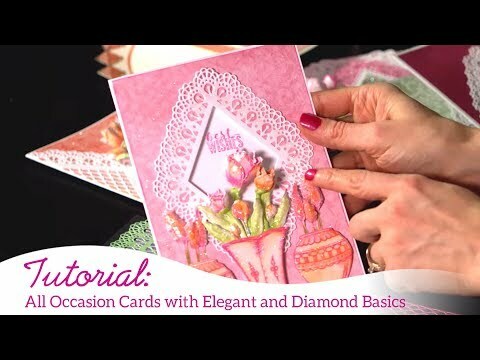 Trim the extra pattern paper and adhere this border on the card front as shown using Darice Adhesive Foam Strips. Stamp the vase from Tulip Vase & Fillers Cling Stamp Set on a piece of watercolor cardstock using Coffee Archival Ink. Stamp the flowers from the same stamp set on watercolor cardstock using Vibrant Fuchsia, Majestic Violet and Olive Archival Inks. Die cut these using matching dies from Tulip Vase & Fillers Die. Stamp the flower bunch image from Tulip Bouquet Cling Stamp Set on watercolor cardstock using Vibrant Fuchsia and Olive Archival Inks. Die cut these using matching die from Tulip Bouquet Die. Color all the images using Zig Clean Color Real Brush Markers. Curve the Vase slightly to give a rounded shape. Arrange and adhere all the flowers, leaves and vase as shown. Add a few pearls and Ebony Black Nuvo Crystal Drops to the die cuts to add finishing touch.